For a company that is supposed to be slightly ahead of its time, Panasonic is somewhat behind the times with its IBM PC compatible portable computer, the Senior Partner. 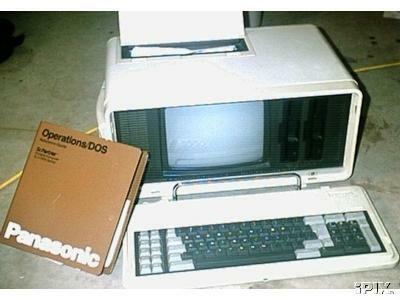 Had Panasomic introduced this machine one to two years earlier, going head to head against then unknown Compaq and other PC compatible portables, the features, marketing muscle, and name recognition would have made it a run-away success. Now, Panasonic faces an uphill battle against many firmly entrenched companies selling IBM PC compatible portables--including IBM itself. Although billed as a portable, the Senior Partner should be considered transportable. It is a heavy machine, about 31 pounds heavy. In contrast to the heavy system unit, the keyboard is surprisingly lightweight, although it seems somewhat fragile and less sturdy than it should be. The keys are well sculpted, and the feel is reasonably good, although a tad on the mushy side. One of the main advantages of the Senior Partner over other transportable computers is the built-in printer. Operating at 55 cps, the printer makes a sound that is scarcely louder than a whisper. Overall, the print quality is good, although letters with slanted and curved lines are not as sharp as they could be. The Senior Partner comes with MS-DOS 2.11, Microsoft GW Basic, WordStar, VisiCalc, PFS:File, PFS:Graph, and PFS:Report--certainly enough to get you up and running with the computer the minute it comes out of the box. 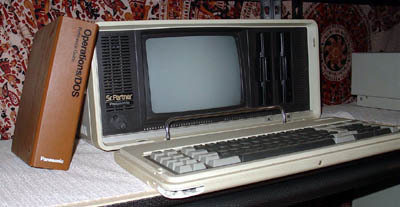 The Panasonic Senior Partner is a fine portable computer. The 16-bit 8088 and MS-DOS operating system provide good IBM PC compatibility. Panasonic bundles an enviable selection of software with the machine. It appears solidy built for years of use. You can use the green screen or hook up an RGBcolor monitor. Curator's Note: if you see in our photo of our Sr. Partner above the fragile keyboard described in the above article sustained damage, so they were right all those years ago!